Milan 2010: Studio Formafantasma of Eindhoven present a collection of tools, vessels and foods made of cereal in Milan this week. Called Autarchy, the collection includes pots and lamps made of flour, agricultural waste and limestone. The material can be hardened by baking at low temperatures or drying naturally, and dyed with vegetable extracts. The designers have collaborated with a broom-maker and bakery to create the installation at at Spazio Rosana Orlandi. Developing further the material and the concept of the previous project “baked”, inspired by the folk event of the “cene di San Giuseppe” in Sicily, “Autarky” is an installation that proposes an autonomous way of producing goods and outlines a hypothetical scenario where a community is embracing a serene and self inflicted embargo where nature is personally cultivated, harvested and processed, to feed and make tools to serve human necessities. “Autarky” pays homage to the uncomplicated, the simple and the everyday. 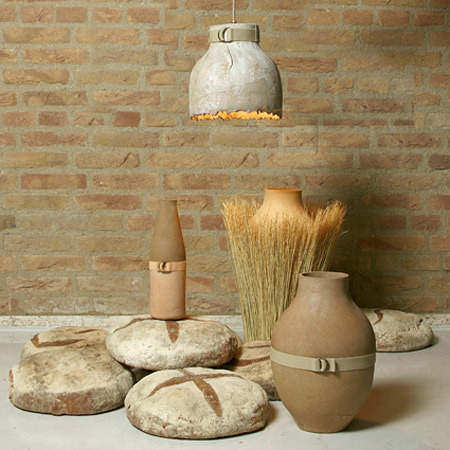 In the installation, a collection of functional and durable vessels and lamps, naturally desiccated or low temperature baked, are produced with a bio-material composed of 70% flour, 20% agricultural waste, and 10% natural limestone. The differences in the colour palette are obtained by the selection of distinct vegetables, spices and roots that are dried, boiled or filtered for their natural dyes. As guests in the project, Studio Formafantasma invited the Italian broom maker Giuseppe Brunello and the renowned French bakery Poilane, to join in the development of the installation. The cereal Sorgho works as a link between these crafts – in a perfect production process without waste, the cereal is harvested and used to create tools, vessels and foods. As an open source where information and knowledge are shared, the installation displays the different steps in the research, explaining the material and production processes of the products. The furniture used to display the products are based on the manufacturing and drying processes used in the project, and feature a drying oven and mill. “Autarky” suggests an alternative way of producing goods where inherited knowledge is used to find sustainable and uncomplicated solutions.